The Freshwater Society presented its Environmental Leadership Awards at the 19th Annual Road Salt Symposium on February 7 in Plymouth. Individual awards were given to six recipients: Stephen Druschel, professor of civil engineering at Minnesota State University, Mankato; the Edina Public Schools District; Precision Landscaping & Construction Inc.; StopOverSalting; Nine Mile Creek Watershed District; and MnDOT District 1. Highlights from three of the recipients follow. 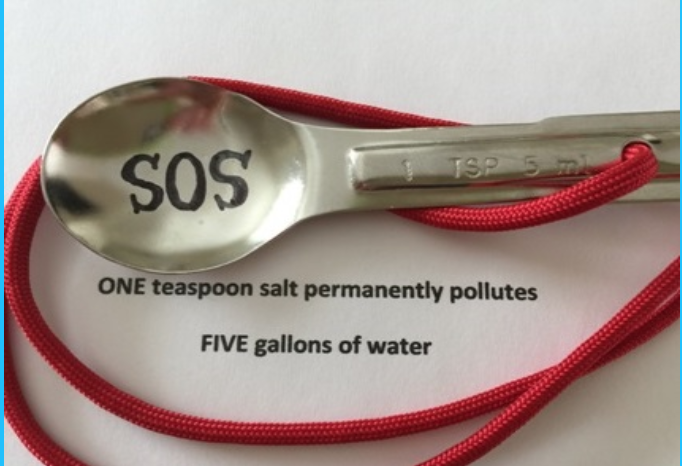 The citizens in StopOverSalting (SOS) are volunteers and Master Water Stewards who were drawn together over concerns about the irreversible damage deicers cause to Minnesota’s waters and the oversalting they saw at properties in their communities. Initially members focused on community education with businesses and nonprofits in Edina, Minneapolis, and St. Paul. They spoke to more than 250 property owners and applicators about the costs of chloride to businesses and the environment. They encouraged attendance at Smart Salting trainings, swept up over one ton of excess salt from properties, and worked with their cities and watersheds. From this they learned that property owners and applicators were concerned about the damage chlorides cause to water and fisheries as well as to structures and landscapes. But the belief that more salt is safer and provides protection from lawsuits was a barrier to reducing overapplication. They began looking beyond education for solutions to the problem. In 2017, StopOverSalting organized with the goal of passing statewide limited liability legislation for commercial applicators. The members committed themselves to learning about the legislative process, contacted the governor and state agencies through the 25% by 2025 initiative, found House and Senate authors for the bill, and educated and testified at the legislature. They worked with cities and watersheds to secure resolutions of support, creating new allies and momentum for the legislation and a broad collation of support. Although the legislation was not enacted in 2018, the forward progress was a success and laid the groundwork for 2019. Nine Mile Creek, located in the Twin Cities’ southwest metro, is impaired by chloride. For Nine Mile Creek to be considered “healthy,” salt applications in the watershed need to be reduced by 62 percent. The Nine Mile Watershed District passed a resolution of support for limited liability protection for private applicators. It recommended a resolution of support to the Minnesota Association of Watershed Districts (MAWD) that was unanimously adopted by the MAWD board. The district also worked with members of StopOverSalting and participated in the Edina winter maintenance model contract advisory committee last fall. Nine Mile Creek is the first watershed to require a chloride management plan as a part of its permit process. It offers cost-sharing grants to help organizations implement winter maintenance best management practices. Nine Mile Creek hosts Smart Salting Level 1 and Level 2 trainings annually and works with other organizations to put on two-hour Salt Solution workshops that focus on winter maintenance for nonprofits and places of worship. MnDOT District 1 implemented two potassium acetate routes in the Duluth area in the 2017–2018 winter season. Potassium acetate has been used on automated bridge systems and by airports for years but is not commonly used to treat roads. The preliminary results are promising, with comparable bare-lane regain time. Last season the district reduced salt use by 70 percent compared with similar lanes without the acetate treatment. In the past the agency had used magnesium chloride in automated spray systems because it is 3.5 times less expensive, but it found that using potassium acetate requires a quarter of the material, which translates to about equal costs for that application. Below 15°F many products are ineffective. Last season District 1 found that during the very cold months of January and February, potassium acetate was the chemical that was most effective in compacted and icy areas. It has not received public complaints.